Market forces after the first OPEC oil embargo corrected the high inflation, low output, and high unemployment that devastated the American economy in the 1980s. But Ronald Reagan's popularity and the long-term nature of the market correction confused both Republicans and Democrats. It certainly seemed plausible that Reaganomics (reduce government, cut taxes, and eliminate regulations) had solved the nation's economic problems. Reaganomics vs the Modern Economy describes the characteristics of our interconnected modern economy and the important roles that government must play to compensate for the inadequacies of private sector markets. Indeed, we cannot even get to the market without public infrastructure. Markets alone won't provide either adequate security (national defense and police protection) or universal public education. It is easy to understand why, as an attempt to defy the clear requirements of a modern economy, Reaganomics always fails as economic policy. We review the history of resistance to government that lead to Reagan's election in 1980. This ended fifty years of frustrations in the Republican Party that started with the election of Democrat Franklin Roosevelt during the Great Depression. Reagan's supporters ignored criticism from many Republicans, including George H. W. Bush, who famously called Reaganomics "voodoo economics." Unfortunately, Reaganomics has proven to be an effective way to get votes. In chapter 2, we discuss natural antigovernment bias and the ease with which voters can be convinced to attack the government that they, and they alone, control. Throughout history, people have often been attracted to appealing economic theories that they sincerely want to believe. 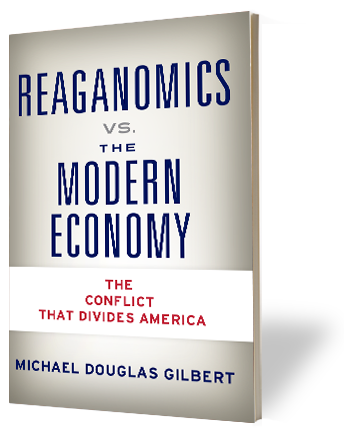 The dissension and chaos of the 2016 presidential election can be attributed to both the failure of Reaganomics as economic policy and the success of Reaganomics as political strategy. In Part IV, we describe public policy that offers the proper combination of free market productivity and public sector remediation. This policy is essential if most Americans are to survive and prosper. Of course, Reaganomics is our guide for what not to do in a modern economy.